Foxes manager Claude Puel says the Premier League side is still coming to terms with last weekend’s tragic helicopter crash. Leicester midfielder Andy King and his wife Camilla pay their respects. CLAUDE PUEL ADMITS his Leicester players are struggling to come to terms with the most traumatic week in the club’s history as they prepare to return to Premier League action following the tragic death of owner Vichai Srivaddhanaprabha. Thai billionaire Vichai, who brought the Premier League title to Leicester in 2016, was among five people killed when his helicopter crashed outside the club’s King Power Stadium following Saturday’s match against West Ham. 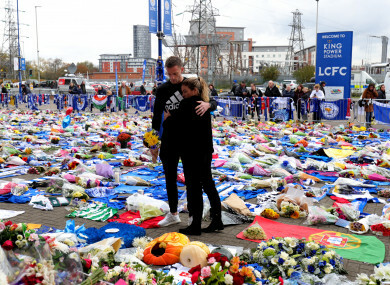 Mourners have turned the King Power into a shrine, with flowers and tributes laid around the arena as the city grieves the loss of the charismatic Vichai. “This has been without doubt one of the hardest weeks in the history of this football club,” Puel said today. Leicester will take to the pitch for the first time since Vichai’s death when they travel to Cardiff in the Premier League on Saturday. Manager Puel has had the difficult task of dealing with players stunned by a tragedy that rocked the football world. Many of his squad visited the stadium to pay their respects this week and Puel conceded it has been a painful few days. Vichai made Leicester City into what it is. He made it a family and made a dream. He invested in the club, the city and he invested in the people,” said Puel. “He truly was loved by everyone inside and outside the club. Personally it was a privilege to work for him. It was a privilege for the faith he showed in me and the moments we shared. Former Leicester manager Claudio Ranieri paid his respects by visiting the ever-growing shrine on Thursday. Ranieri, who masterminded Leicester’s stunning title triumph in 2016, was accompanied by Srivaddhanaprabha’s son Aiyawatt as he laid a wreath outside the stadium. Given the circumstances, Puel knows the result of Leicester’s clash with Cardiff is of secondary importance. But he hopes his team can use their forthcoming matches to pay tribute to the man whose investment and ambition turned the club into kings of England for one magical season. “He leaves behind a legacy that will be remembered forever and his vision for the club that myself as manager we take forward,” Puel said. “I have never been prouder to be manager of this club. In such difficult circumstances – from staff, players and fans, they have shown what a special club this is. Leicester players and staff have been offered grief counselling in the wake of the disaster, with players such as Jamie Vardy and Kasper Schmeichel among those to post emotional tributes online. “A lot of people have been made available to help the players and staff and I think everyone’s reaction to this event is different,” Puel said. Having postponed Tuesday’s League Cup fourth round tie against Southampton in the aftermath of Srivaddhanaprabha’s death, the club have confirmed the match at the King Power will now be held on 27 November. Leicester’s first home game after the crash will be a Premier League encounter with Burnley on 10 November. Email “Leicester boss left 'numb' after 'one of the hardest weeks in the club's history'”. Feedback on “Leicester boss left 'numb' after 'one of the hardest weeks in the club's history'”.